Planting a garden with food potential is one of the most valuable things we can do. 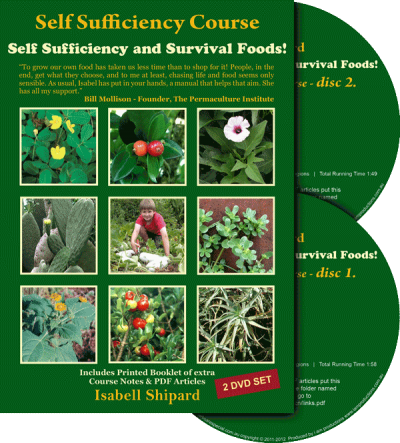 We need to encourage one another to be as self sufficient as possible… now… in our gardens, as this is the most nutritious fresh food and cheapest way to live in these times of rising prices. Growing our own food is very satisfying as well as beneficial to health and well-being. 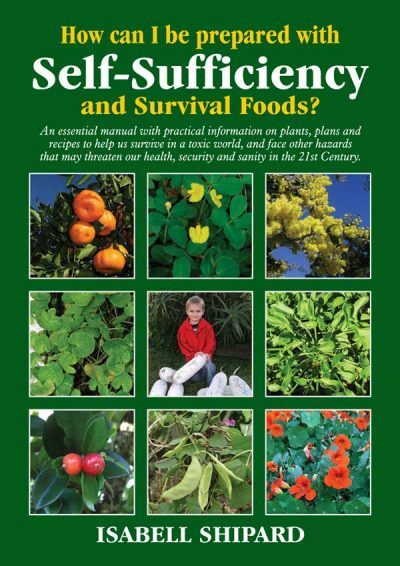 Being self-sufficient is not just living on less – it’s about increasing our quality of life while decreasing our dependence on money, fossil fuels, and consumer-ism. By creating a more sustainable future, we can view the future, more positively. Positive vision breeds enthusiasm, which also breeds action. I do encourage everyone to be prepared with an action plan. Herbs are a great source of nutrients, antioxidants, vitality and to help to keep body disease free. Vitamins and minerals in plants are nutrients we all require daily. Herbs also have a wide range of phytonutrients, that is, plant substances that support our health and wellness. Many thousands of phytonutrients have been researched and many more will be discovered and classified. Plants with strong aromas, flavours and colours are high in phytonutrients and anti-oxidants. The picture here is of greater galangal (a member of the same family as ginger and turmeric) is a phytonutrient-rich herb. These plants have just come out of winter dormancy and are showing their glory, in full bloom. Want to keep the immune system working well – drink a herb tea blend with Herb Robert (Geranium robertianum) several times a day and include a few slivers of fresh Ginger; as ginger is a natural immune booster). Herb Robert is the most requested herb at the Herb Farm, a herb with so many applications, and also as preventative medicine. Grow the plant and chop 4-6 leaves and stems over breakfast cereal, or use a teaspoon of chopped leaves to make a tea. 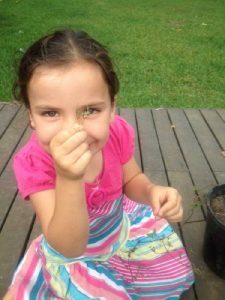 The pictures below are of Chloe, Kath’s 4 year old niece, showing how to pick mature seeds of the herb; they must be well filled out capsules (look like stork bills), and feel hard, when pressed between 2 fingers. It is wonderful to see that a child has been shown how to pick these seeds. Every child needs to be taught how to pick seeds of herbs, vegetables, etc, for growing more food plants. Broad leaf plantain (Plantago major) has many uses, including evaporating the pain of cuts and preventing swelling. 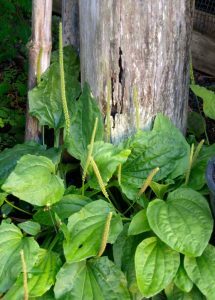 Plantain has been an important healing herb throughout history. My herbal mentor always said, “Wherever white man goes, there goes plantain.” This saying could be explained, firstly, that white man discovered and revered the many healing properties of the plant and always took seed with him when settling in new areas; and secondly, relating to the fact that the seed swells up when damp and sticks to clothes, and would have been spread widely, and, indeed, it is a common weed, with great value. My mentor shared how plantain was valuable for any bleeding, internal and external, and this is something I will never forget, as shortly after hearing this, my husband, accidentally, cut his hand severely. I remembered where I had seen some plantain growing, picked some leaves, crushed them in my hand, placed them on the cut and started to affix it with a bandage. But the leaves, being large and awkward under the bandage, meant it was not very firm, so I unwound it to try and make it tighter; to find that once the plantain was placed over the cut, the bleeding had stopped. 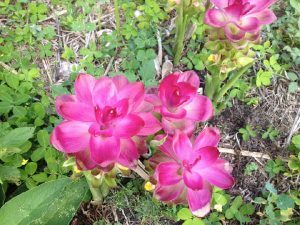 This was a vivid lesson to the value of herbal folklore. Allantoin, is the substance in plantain leaves that helps knit cells back together. It has an anti-inflammatory action, and a speedy healing property that stimulates growth of new cells, and also gives the immune system a boost. 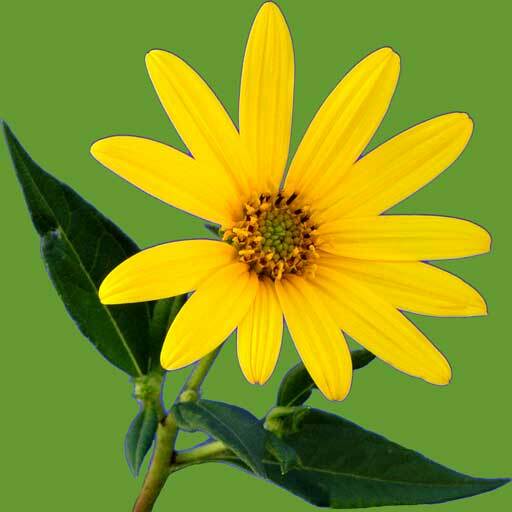 Remember this herb next time you have an abrasion, cuts, nick yourself when shaving, wounds, tropical ulcers and broken bones. Plantain as a tea has been a revered herb for all disorders of the respiratory system, for mucus congestion, coughs, sore throats, bronchitis, asthma, hoarseness, influenza, hay fever, sinusitis, tuberculosis, and numerous other ailments of man. As plantain is so hardy and grows in numerous places on the Herb Farm, we regularly use it in our juicing regime, of greens, herbs, vegetables and fruits in the morning. The plantain seed tops are a food source too. Just strip the seeds off the fully mature and dried seed heads. As the husk around the seed is edible too, there is not need to winnow. Add the seed and husks to any grains when cooking, like rice, quinoa, oatmeal, millet, etc; use about 1-2 tablespoons of plantain seeds to 1 cup of grain. Plantain seed/husks when soaked in cold water overnight are a high fibre food, and will act as a bulking laxative (use 1 tablespoon in ¾ cup of water). 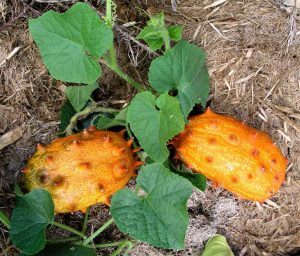 African Cucumber (Cucumis metuliferus) is an extremely hardy plant. When the cucumbers are mature and picked, they will store for several months, just sitting in a shady place. Eventually the vegetable turns orange in colour and breaks down. Cucumbers can be used fresh, added to a tossed salad, set in a green or yellow jelly, made into pickles, used when juicing vegetables, etc. 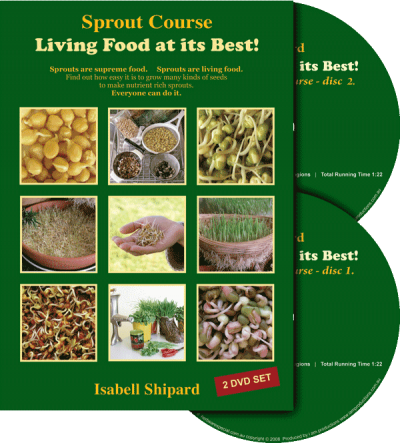 Plant some seeds this spring and summer, as the plant is a valuable survival food. The cucumbers are cooling to the body and act as a diuretic and anti-inflammatory. 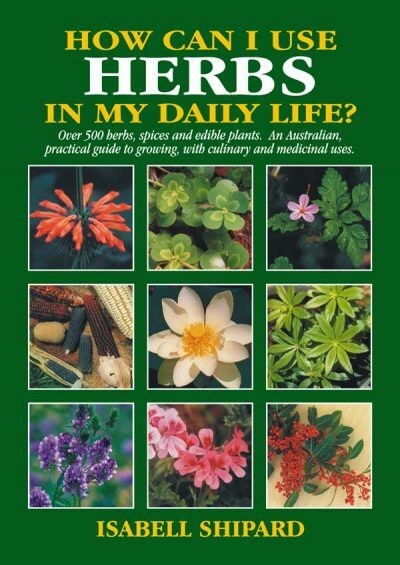 Make herbs part of your daily life! Plan each morning to go into the garden and pick fresh herbs to garnish your breakfast, whether it is cereal, muesli, toast, or a cooked breakfast. 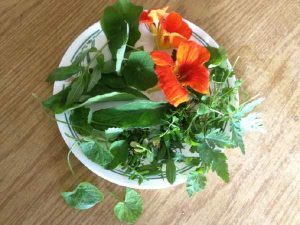 Keep in mind that the fresh herbs will be the best thing on your plate to benefit your health; herbs like nasturtium, gotu kola, herb robert, brahmi, sheep sorrel, small flowered willow herb, parsley and many more. Have a go, at growing this special radish, known as black radish, which is an appropriate name, as you can see by the colour of the skin. The inside flesh in white and quite pungent in flavour. Use grated in salads, add to smoothies, vegetable juicing, cooked dishes. Try slicing the radish 2 cm thick and sautéed in a little butter. The butter mellows the pungent flavor. Add herbs to the cooked slices and top with grated cheese. Black radish has had medicinal uses including: for rheumatism, constipation, bronchitis, coughs and as a powerful immune booster. A traditional cough remedy, used finely grated black radish with honey added, covered and let stand several hours. The grated radish releases juice. The mixture can be eaten, or the juice drained off and drunk 1-2 tablespoons at a time, several times a day. 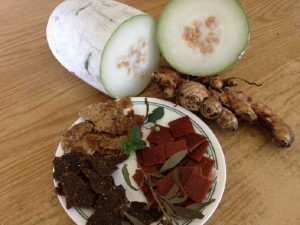 In ancient times people believed that the black radish on the meal table was a guarantee of long life; perhaps this is why my herbal mentor had a high regard for black radish and encourage his students to grow and use it. Recently I have been reading about the chemistry of some foods, and came across the work of Dr. Ragnar Berg, at the laboratory of food research in Germany at Dr. Lahmann’s sanitarium. At the beginning of the twentieth century, Dr. Berg, a Swedish nutritional scientist, studied the mineral content of foods, to find, that certain foods had acidifying or alkalizing effects on the body. Berg’s Tables are an index of foods, and is designed to indicate the extent of our alkaline mineral intake and to help assess possible risk of latent acidosis in the body. Food analysis showed the positive properties of some foods and the importance of mineral salts which are alkaline, to neutralize acids. These foods were then found to dissolve/neutralize and help eliminate mucus and toxins from the body. Highest on Berg’s Tables valued as excellent internal scourers and for alkaline benefits was black radish (39.40 Plus or Acid-Binding); next highest plant was dill (18.36), dandelion (17.52), endive (14.51), tomatoes (13.67), and close to follow on were sweet potatoes, beetroot, lettuce, cucumber and beans. 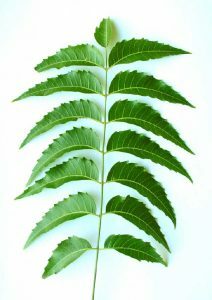 Neem Tree (Azadirachta indica) is a tree worthy of a space in the garden. If limited in space in your yard, it could be grown in a large pot and pruned to bush size, and keep all the prunings to use. The leaves are valued as a detoxifier, blood purifier, tonic, an aid to digestion and a traditional remedy for many ailments. Scientific research has found that neem acts as an immune system booster by bracing lymphocyte cells to respond to infection and other challenges against the immune system. In India the neem is an esteemed tree, often referred to as ‘the village pharmacy’. In Sanskrit neem is known as “nimb” and its meaning is defined as ‘that which keeps diseases at bay’. Rice Beans (Vigna umbellata) A fast growing annual legume ground-sprawler; excellent nitrogen fixer, very young beans can be eaten raw or cooked (21% protein), and leaves can also eaten. 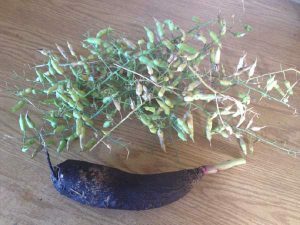 Pods can be left to fully mature and turn brown, be picked as the seeds stored for future use, and cooked like any other pulse seeds in meals. 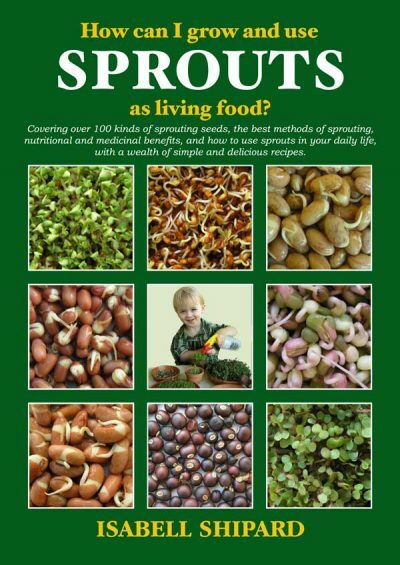 The seeds also can be sprouted in your kitchen, like mung beans, and they have a similar flavour. 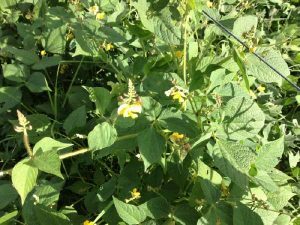 Rice bean plants are a practical soil-improving green manure crop, and for controlling soil erosion; also, good for use as mulch for the garden. Rice bean can be used for stock feed. Plant seeds spring and summer. 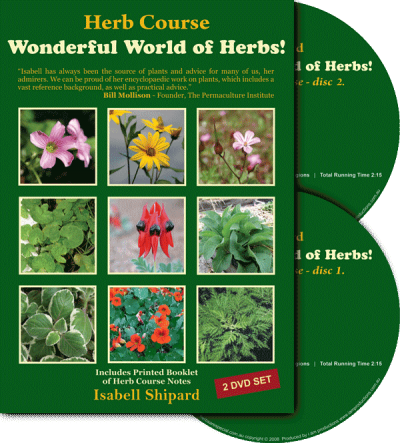 Learn more about these plants in Isabell’s books.